The dictionary defines restoration as the act of returning something to its original state or a former more desirable condition. First, let me say I do not think every car should be restored. Original cars will always have the greatest value. 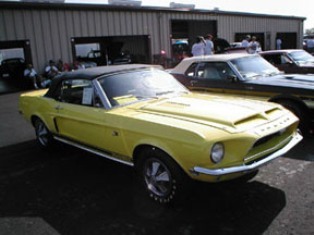 When the decision to restore a car is taken, the owner must decide how the car is to be used. In some cases, the car will be a model or elite show car. These cars are often called "concours" or "thoroughbred" cars. The other option is to return the car to the street. In my opinion, both cars have a place in the hobby. The decision is an important first step in the restoration process. If you choose to drive your car, you will probably not elect to use a new, old stock air filter. A reproduction filter, that resembles the original may be more appropriate. Each decision taken during the restoration process will effect the final appearance of the car. So, can a car built for the street be competitive at a high level with pure concours restorations ? I think the answer is "yes". Below are two excellent examples. Both of these cars won Shelby American Automobile Club Concours Silver Awards. I only restore 1968 Shelbys. I have a compiled a library of materials that revolves around this one car. The information on this website is a small fraction of the material I have collected. Some of the items such as factory manuals and records took years to acquire. 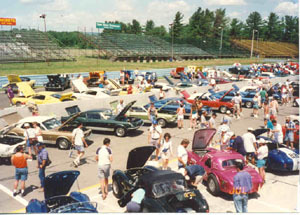 When I started the "special paint" project in 1991, very few people even knew these cars existed. To date, I have uncovered information on 157 of the 159 special paint Shelbys built during 1968. I have found a vintage Ford microfische machine with a copy of the 1968 Master Parts Catalog to assist in parts identification. I have notes and pictures from dozens of unrestored cars and I continue to work on cars daily. 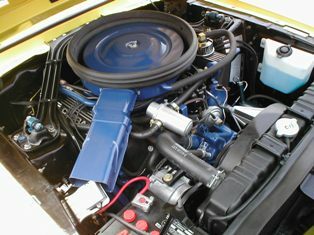 This GT500KR engine lost only 2/10 of one full point for authenticity at a recent SAAC convention. Once you decide how the car will be used, the restoration can be started. I divide the restoration process into four equally important stages. Stage one is documentation and teardown. The importance of documentation is discussed on this website. How the car is disassembled is also important. You want to document as many of the details as possible. Generally, I do not copy details from other vehicles. Preserving as many original parts as possible is important. Reproduction parts can be used in some instances. These decisions are made on a case by case basis. Stage two is cleaning and refurbishing parts. Bodywork and paint are addressed in this stage. Most people do not understand the amount of labor that goes into a quality paint job. Preparation is very time consuming. It is essential that you have someone who knows Mustangs complete this stage. The difference between an average car and a great car start here. Stage three is reassembly. It is important to have an understanding of both the Mustang and Shelby procedures. There are variations even among 1968 Shelbys. Getting all the correct parts, nuts and bolts in the right places can make or break a car. You have probably seen a beautiful paint job only to have someone place the fender emblems in the wrong locations. An assembled car is not complete until it has been checked and tested. All mechanical aspects should function as new. How many times have you seen a functioning tilt steering wheel ? Restoration is labor intense. Complete restorations can be anywhere from 700 to 1000 hours of labor. If you are missing a lot of parts or have a rusty car to start with, it will be more expensive. It will take a specialist to properly restore your 1968 Shelby. If you are interested in discussing a full restoration, please email me. You will find my rates more than reasonable and you will leave with a car you can be proud of. One that looks factory correct. If you want to drive the car, I can do that too. To start, you should get your documents in order. An undocumented Shelby is not acceptable. I explain the documentation process on the website. You have to be patient and keep looking. It is not unusual to have gaps. Work on filling the gaps. "Is there a book I can buy that will tell me how to restore my Shelby?" The answer is no. Most people that restore cars have spent years, even decades accumulating detailed information. It is unlikely they will hand it to you. If you can't afford a specialist, then you will have to collect bits and pieces by yourself. Mustang and Shelby Club judges are an excellent resource. Seek out the judges. Most have experience restoring cars. Just remember a judge is not the final authority. Judges can be wrong, but in most cases, they are familiar with production variations and details. The Shelby Club is an excellent resource. Attending the annual convention is the best place to find information. I still find "new" things on 40 year old cars. No one person can know everything and you will get a chance to talk to people with cars like yours. I learn more at conventions than any other one source. You will also find unrestored cars. Original owners are an excellent resource. If you can locate them. They may be helpful. One original owner told me he distinctly recalled the fiberglass on his car. After a year or so, the fiberglass had faded to a different shade of red from the body. He also showed me his original shock absorbers. The Ford assembly manuals are a good start, but you need to compare the information in them with actual cars. 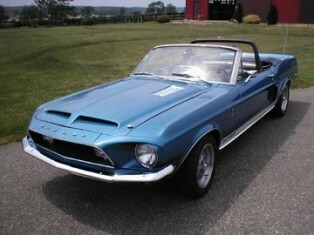 Try to find other 1968 New Jersey built Mustangs as reference. The Ford Master Parts Catalog can also come in handy. The catalog may list color codes for specific parts. Be careful there are some sources you want to stay from. Don't assume all restored cars are correct. Be careful looking at cars in magazines. This includes older press photos. Many older magazines have pre-production cars and unacceptable information for research. Try not to use cars built at Dearborn and San Jose as reference for the 1968 Shelby. Every plant had a unique way of putting the parts together. 1968 Shelbys actually went to two separate plants (New Jersey and Ionia). Lastly, if you have a 1968 car don't copy a 1969. Too many restorations spend too much time on copying color codes that were never there.